The Sun Also Rises Themes was one of Ernest Hemingway’s most profound novels, and contains a number of complex themes, each more demonstrative of his writing skills than the next. This is a topic suggestion on The Sun Also Rises Themes from Paper Masters. Use this topic or order a custom research paper, written exactly how you need it to be. As one of Ernest Hemingway’s most profound novels, The Sun Also Rises contains a number of complex themes, each more demonstrative of his writing skills than the next. The most obvious of these themes is the legacy of the “lost generation,” of whom Hemingway was a member. Their unique experiences in World War I set the stage for the life they would lead in the 1920s Paris, creating the setting for this novel. However, there are other pressing themes to be considered as well. 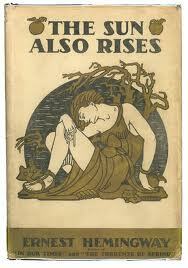 The theme of women and love, both physical and emotional, was demonstrated extensively in the novel, representative of the changes taking place in women’s lives in the 1920s. Demonstrated by Lady Brett Ashley, this “new woman” was one without fear. She embraced her sexuality, was aware of her physical appearance, and gradually begun to shrug off the norms of conventional society. Hemingway also focuses on the theme of masculinity throughout the course of the novel; it is unsurprising, then, that this theme interplays with the one listed above. The primary character, Jake Barnes, was injured in World War I and has been rendered impotent. His masculinity has been taken from him, and he spends the course of the novel attempting to come to terms with this. His physical condition is sharply juxtaposed with Ashley’s sexuality: while he, a man of the age when his peers are demonstrating their dominance and virility, is unable to behave in this manner, she is taking the reins, so to speak. For as much as he breaks from the norm of masculine sexual aggression, she breaks from the norm of female sexual docility. By utilizing the characters in this way, Hemingway is able to demonstrate the close connection between all aspects of his novel, from the setting and characters to the mood and theme. Paper Masters writes custom research papers on The Sun Also Rises Themes and discusses the themes in The Sun Also Rises, which focuses on the theme of masculinity.